Maison élégante et confortable dans un quartier résidentiel de luxe calme, mais à quelques minutes de divertissement, shopping et les superbes plages de Divi et Belair. cuisine entièrement équipée. Le Rm Salon et salle à manger Rm ont une paroi de verre 14 'haute poursuivre doubles et triples portes Slid'g permettant de complètement ouvert à Porche voûtée couverte. Surplombant l'océan, l'île de Saba, proximité plage paradisiaque Little Bay. Une vue à 270 degrés avec de majestueuses montagnes en arrière-plan. Venez voir comment il se sent à vivre pendant un certain temps '' La Dolce Vita '' ... !!! Having to read all the bad reviews why don't some people just pay for a $1000 per night and have a five start Villa. I admit this villa is dated but also had a spectacular view. When on vacation all we want to do is go to the beach and explore Sint Maarten. 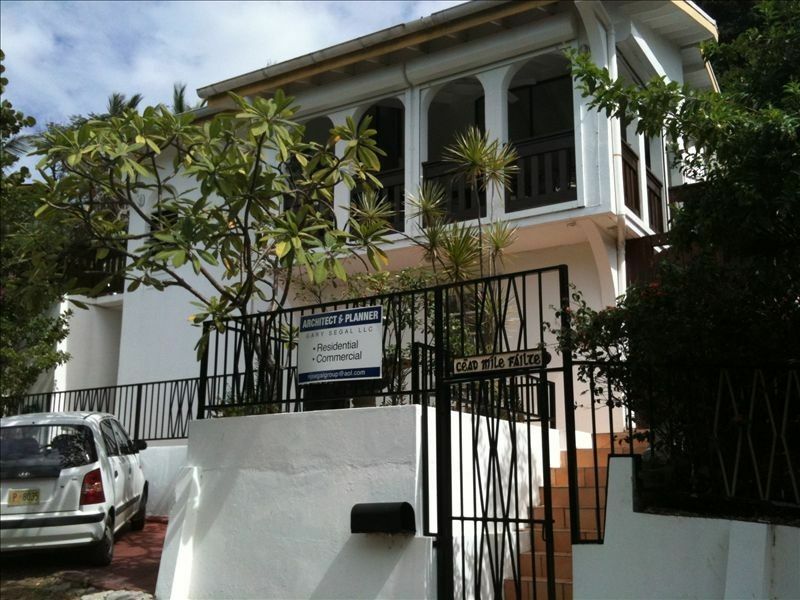 This home is somewhere to come and enjoy Sint Maarten to the best. Has all the amenities you need and very accessible. Why do people a only talk about the bad things that happened at properties but never the good. I totally disagree with bad reviews because this villa isnot as bad as people say it is. Of course I appreciate your good words about our Property. We really try to make our guests to feel the same as in a $1,000 / night place !...BTW ; the friendly feeling we give to our visitors has no price-tag on it !!!. Thank you again ! Upon returning from our vacations in Sint Maarten and Florida, I felt compelled to write a review for the Dolce Vita or " AT WIT"s END" which is the more appropriate name. On January 12th, we met the property manager and realtor, Tahir, to view the property. Upon entering , we noticed a smell from the septic, which was not at all pleasant. The furnishings were old and worn, and there was no semblance of decor----mismatched everything. We decided that we could not stay there and asked for our money back. We were told that we would lose our money if we cancelled even though we were going to rent on Feb4th. I talked to the owner and he said he would take care of the problem and even buy a new sofa! There were limited glassware’s and silverware (one wine glass and two small spoons). The safe and washing machine were broken and were fixed or replaced in approximately two weeks. We encountered a sewer smell in the lower bathroom that had no lights (one light missing and the other one was burned out), the spray hose for the shower was laying on the shower floor which was replaced by the owner in approximately two weeks. The TV in the master bedroom didn’t work, the owner added a WiFi extender (in approximately 2 weeks) and it worked for 1 minute and froze for 5 minutes. If the TV upstairs was on it even got worse. The spray hose in the master bath was kinked which allowed a small amount of water to pass thru and was replaced by the owner in approximately two weeks. The villa was advertised with a king bed in the master and it had a queen bed. There was no hot water for the kitchen sink, dishwasher or washing machine. When it rained we encountered a problem of water pouring in from a window behind the hutch which flooded the dining room floor. The deck had many rotten boards. We almost fell thru the deck. There was no lock on the patio door which made us feel unsafe. The pool skimmer didn’t work and we had to clean the dirt from the top and bottom ever day in order to use the pool. There were light bulbs missing in the ceiling fans in the all bedrooms, dining room, and kitchen (all three bulbs were missing). The grill was rusted and unfit for cooking. The owner brought people into the house when we were not there which is not ethical. A painter started painting the deck while we were gone which made it difficult to use the pool so we asked him to leave. The owner offered us a $300 cash refund and 2 free nights for our next visit which he valued at $1,200 (with our bad experience why would we want to return on our next visit) if we didn’t write a bad review. I asked for the $1,200 value and he said no. The owner did show up towards the end of our second week and tried to help but it was too little too late. The CONFIRMATION that everything was addressed as needed, is already stated in this review. The FACTS : the 80 year couple found out in the last moment BEFORE the scheduled arrival date that their friends decided not to join them anymore (now I understand why... ) and asked me a full refund. Since was less than a week before their arrival to stay for approximately 1 month, I offered only a partial refund. With this in mind, was clearly understood that the "race" to bring reasons for some refund started from day one. Our PROPERTY MANAGER attended with complete dedication on every moment. Example : THE LAUNDRY WAS PICKED UP AND DELIVERED professionally cleaned FREE OF CHARGE ! ! ! CONCLUSION : come and enjoy your vacation in our place !! !...attended with dedication by a friendly and professional staff. My family of 10 have returned from a 2 week stay at this great property. A wonderful 2 week stay and we really appreciated the speedy response to some of the minor inconveniences we experienced at the start. The property overall is in a great location, convenient to Phillipsburg and the beaches with amazing views. Natasha was a pleasure to deal with and very responsive to our texts/calls and a big thanks for escorting us to the property on our night of arrival. Bedrooms and bathrooms are large with all you need. You will need a vehicle to get around on the island and make the most of a visit. Your nice words, filled my heart with happiness !...without realizing, you become a partner in my rental business, since your great review will help increase our bookings. Therfore, please enjoy an extra FREE NIGHT if you decide to visit St Maarten and stay in our Villa for a week ! We were two families of seven staying at La Dolce Vita over the New Year’s holiday. While the views at the villa are indeed beautiful, the house is in a state of disarray and disrepair that cast a pall over our vacation. Apart from ‘minor’ deficiencies that we chose to overlook (not enough silverware, broken chairs, defective showerheads, and much more), the house lacked adequate water pressure and had faulty wiring. Throughout our entire stay, we had to shower one-by-one and hand wash dishes for seven. Even seven people showering in a row was begrudgingly sustainable at first, as we were trying to make the best of our long-awaited holiday. On New Year’s Day, we returned to the house after a lovely celebratory dinner to find a burning smell, appliances not working, some lights out, etc. The kind building manager, Natasha, arranged for electricians to come the next day, who assessed that it was miraculous that the whole villa had not burned down from the sorry state of the electrical wiring. I note Natasha’s contributions and assistance, because past reviews corroborate that she has had to come to the Villa’s rescue too many times. Throughout four days on St. Martin, we had to be in constant communication with the building manager because of issues with the rental. Time that we could have spent admiring the villa’s views--which are prominently advertised--was instead spent on the phone, and indoors, sitting with Natasha and electricians. This time, the views alone could not save a vacation ruined by the dire need of upgrades and repairs to La Dolce Vita. Until serious efforts are undertaken to improve the villa’s state, it will continue to disappoint and be a safety hazard. It's so sad to see that "money can buy everything"...even avoiding to have an unfair review !....well, I DIDN'T ; I did not let Yelena to blackmail me !...I did not agree to refund the entire rent + + +, for her promise to not post a bad review. Nevertheless, I offered as a courtesy, a half back, because I still want to be fair !. The house is approx 20 years old and was completely renovated 4 years ago, when we built the Pool, the Terrace and enlarged a Bathroom. For some reason, the Dishwasher overloaded the circuits and some portion of the house had no electricity for one night ; everything was fixed promptly in the morning. We're constantly buying new things for our Villa ; since than, we already have a new Dishwasher, a new Microwave, Blender, Pillows, additional chairs, pots, silverware and many more !. The Garden, the Pool and the entire Property it's continually manteined and groomed. Our Property Manager is always available to assist our guests with professionalism (being also a real estate agent). Très privé dans un quartier résidentiel luxueux, à quelques minutes de la plage de Little Bay et de la célèbre plage Divi Resort. À 5 minutes en voiture des boutiques et des casinos de Phillipsburg, à 15 minutes des excellents restaurants français et du port de plaisance de Marigot.